In his YouTube channel description, Sean Woods explains that he created his channel in 2012 as a "fun way to share my passions for history, primitive archery, flintknapping, survival skills, hunting, heirloom gardening, cooking, and a variety of other subjects." He says that last year, "the direction of my channel completely shifted when I accidentally discovered people enjoy watching videos about mouse traps." Now he posts videos almost exclusively about pest control, and he has 800,000 followers. In this video Woods goes after yellow jackets. Anyone whose been stung by one knows how painful it is. I've been stung by bees many times and I barely care. But a yellow jacket will sting you multiple times in a second and each sting feels like getting punched with an icepick. Woods starts out by digging up an underground wasp nest in his backyard. It looks like a hazardous job. First he sprays wasp killer into the hole in the ground leading to the wasp nest, digs with a shovel, sprays more, and digs some more. Even when he drenches the nest with spray some of the yellow jackets are still active. In fact, Woods was stung by one off-camera, but he does't seem to mind. He must have a very high threshold for pain. 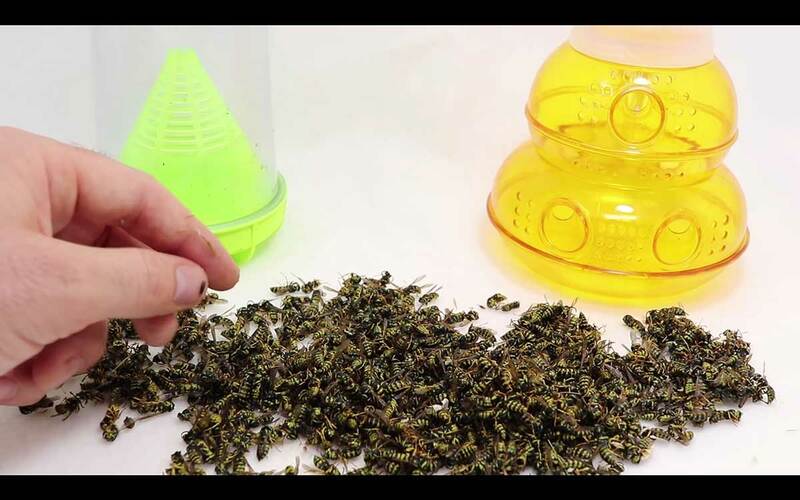 In the second part of the video, Woods tests three wasp traps. Two are store bought, and the third one is homemade. He uses chicken for bait in two of the traps, commenting that the wasps are "greedy" for meat. His homemade trap beats the other two by a wide margin. Does pure capsaicin repel mice and rats? Do moth balls repel mice? Will the world's hottest pepper keep mice and rats away?